How was your Thanksgiving? What was your favorite dish at the table? Mine ended up being something I never imagined would taste so good. A Buttermilk Pie that my F.I.L. made. It tasted completely opposite of what you would imagine. It is a sweet, custard-base pie, that is baked in the oven, which creates a sugary crusty topping. Serve it with a little whipped cream and it is rich and creamy and absolutely delicious. You could even serve it with sliced bananas, strawberries, raspberries, chocolate shavings or whatever. But I will share these cookies with you. I try to buy only one carton of eggnog each year. It's just something I have to limit myself with, because I LOVE the stuff and I will drink every last drop in that carton and then move onto the next one. Since it isn't even December yet, I had to mimic the flavors without actually using the real thing. 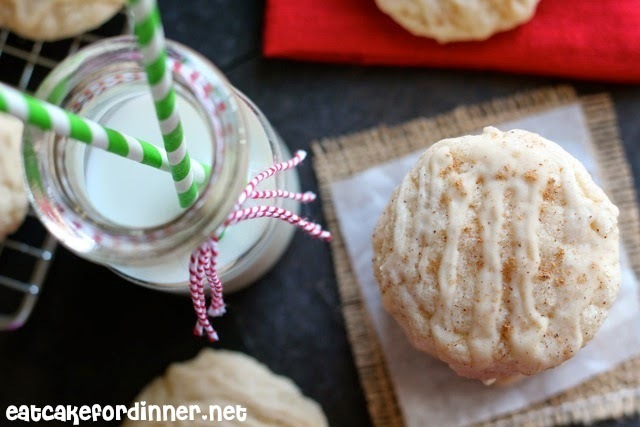 These cookies don't actually have eggnog in them, but the flavor is similar to homemade eggnog (which does taste different that store-bought). Combine rum extract and nutmeg and you have instant eggnog flavor. 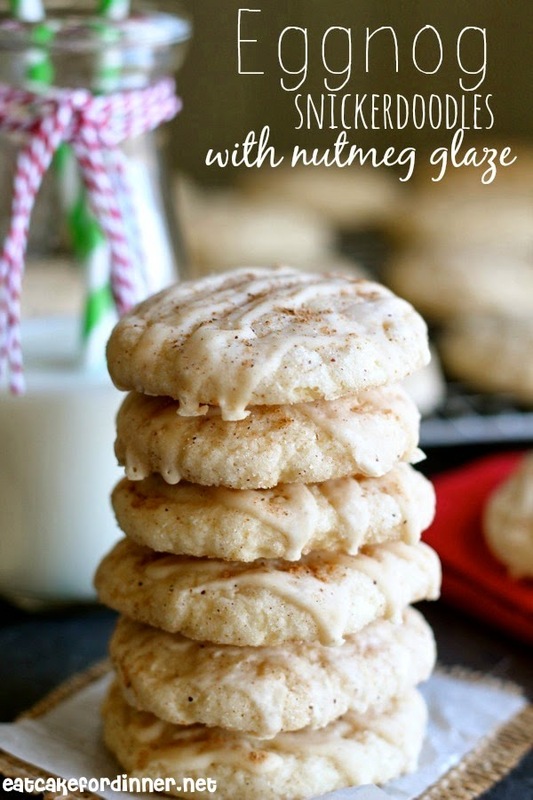 If you are not a nutmeg fan, then you might not like these cookies. You could always use cinnamon instead, but then they won't taste like eggnog. 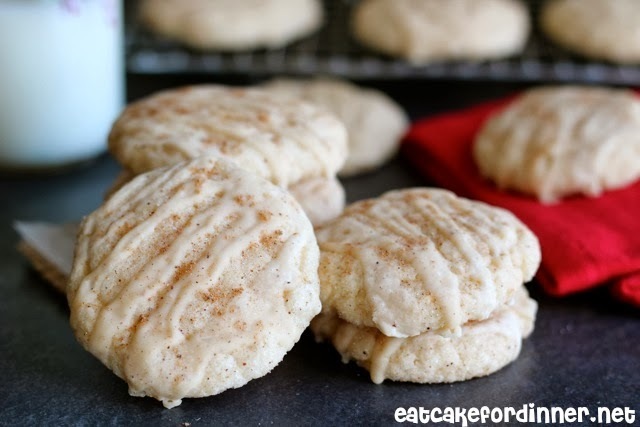 They are soft and chewy and have a light eggnog flavor. Preheat oven to 350 degrees. Cream together butter and sugar until very light and fluffy. Mix in the rum extract, vanilla extract and the egg until well combined. In a separate bowl, combine the flour, salt, baking soda and cream of tartar. Add the dry ingredients to the creamed mixture alternately with the evaporated milk, starting and ending with dry. Mix until just combined. In a small bowl, combine 3 Tablespoons of sugar with 1/2 teaspoon of ground nutmeg; set aside. Roll dough into 1 - 1 1/2-inch balls and roll in sugar/nutmeg mixture. Place on a greased baking sheet. Use the bottom of a cup to flatten the dough balls. They do not spread much during baking, so make sure to flatten them. Bake for 11-12 minutes. Remove to a wire rack and cool completely. Yield: 3 - 3 1/2 dozen cookies. For the Glaze: Whisk together all ingredients until smooth. If it is too thick, add a little more evaporated milk (a little goes a long way). Drizzle over cooled cookies. Sprinkle with a tiny amount of nutmeg, if desired. Store in an air-tight container. Jenn's Notes: I used Rum Bakery Emulsion in the cookies which is a water based extract instead of alcohol, so supposedly the flavor won't bake out as much. I'm with you--can't leave the eggnog alone if it's available --I love it! These cookies sound so good. I haven't baked since DH was diagnosed with diabetes--I don't want to be the only one eating a whole batch of cookies, but I may make an exception for these! I havent had eggnog too much, but I like it! I'm currently on an eggnog binge! I already have some eggnog recipes lined up for December and I'm going to add this to it - it looks delicious! Pinning this also! Isn't eggnog the best :) Thanks for the pin. How do I substitute if I want to use egg nog instead of just flavor with spices? Well, you could always use eggnog in the glaze instead of the milk and nutmeg. With the cookie, it's a little trickier, because I'm not sure if it will change the texture of the cookie. If I had eggnog, I would have tried it, but I don't have any. You could try using eggnog instead of the milk and see what happens. You could also cut the recipe in half for your first attempt. If you try it, please let me know how it works. This looks wonderful must try and must share thanks !!! Im confused. Why do recipes call for unsalted butter then add salt would you not simply use salted butter and leave out the salt? If you use unsalted butter, then you can control the amount of salt you are adding to a recipe. If you use salted butter, you really don't know how much salt is in it and each brand could be different.